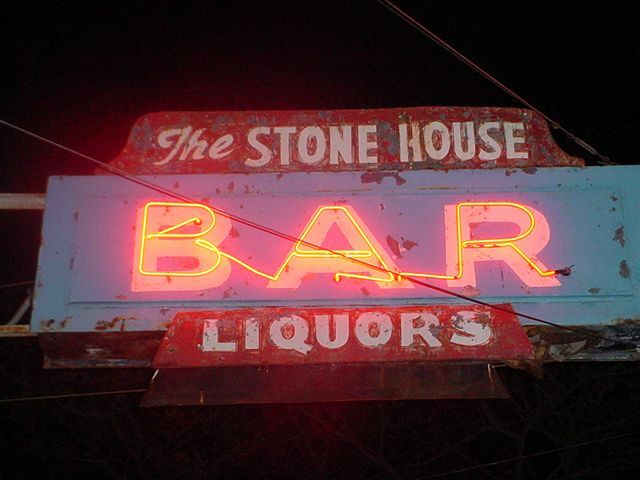 The world famous STONEHOUSE bar is Michigan's oldest continuously operating bar. It's located in an 1860's two story Victorian house on Ralston St. one block east of Woodward Ave. and one block south of State Fair Ave. and the Michigan State Fairgrounds on Detroit's near east side. The "House", as it is affectionately referred to, was the original farmhouse when the surrounding area (including the state fairgrounds) was still farmland. Sometime around the prohibition era it became the clubhouse for the legendary Purple Gang. The Purple's were Al Capone's motor city muscle and ran most of his illegal enterprises in and around the Detroit area. It is rumored that during the reign of the Purple Gang, the downstairs was the gang's clubhouse and the upstairs was a brothel run by the gang. One of the most endearing features of the Stonehouse is the big Victorian style covered porch out front where you can sit and enjoy your favorite cold beverage. The jukebox is loaded with favorite old and new rhythm and blues and the music is piped out to the porch for the enjoyment of the folks out front. There is ample parking in the area but the sidewalk and the street in front of the bar is reserved for motorcycles and on most nights there are bikes of all makes lined up as far as the eye can see. There's a horseshoe pit on the side of the building and the competition can test even the best of pitchers. There's also a yard out back were on most weekend there's usually a bar-b-queue, weather permitting. "COME AS A STRANGER, LEAVE EVEN STRANGER"